I believe it was Feb 2003 when we, the LUNAR Rocketry club, found ourselves at a rocket launch and no Pyro III (Pyrotechnic Operator - Rocketry Class III) on site. So at our semi monthly LUNAR meetings we adopted a motion to commission 5 Pyro III’s. Luckily, our only Pyro III, Joe Heckenbach, attended the meeting and he dropped a hint for us 5 potential Pyro III. “When it comes time to study for your test, you only need to look at the rocketry parts. You can skip all the fireworks stuff.” These were some immortal words I would hold on to dearly. Pyrotechnic Operator Rockets Third Class may purchase, transport, store, and launch high power rockets. Experimental high power rocket motors may only be imported, exported, and wholesaled by individuals or companies holding valid import, export, or wholesale licenses. Pyrotechnic Operators Third Class may only purchase high powered rocket motors from licensed wholesalers. Operators licensed under subsection (b) are also required to obtain a local permit from the authority having jurisdiction prior to all launches. To simplify this, we have to have Pyro III to fly Experimental High Power rockets. Dare I define this? Sure! I compiled this from a couple of sources and I think it meets the intent of the code book. It’s a rocket that (1) is propelled by one or more high power rocket motors (more than 160 Newton-seconds (36 lb.-seconds) of total impulse or an average thrust greater than 80 N (18 Ibs) or more than 62.5 g (2.2 oz) of propellant,) ; (2) is propelled by a combination of model rocket motors having an installed total impulse of more than 320 N-sec (71.9 Ib-sec); (3) is propelled by a combination of model rocket motors having more than a total of 125 g (4.4 oz) of propellant weight; or (4) weighs more than 1500 g (53 oz) with motor(s) installed. Here is a table I hope makes it easier. First step, make the call to Sacramento. Debbie handled my call at 916-445-8373. I asked for application material for obtaining a Pyro III license. She sent me “Pyro Technician Certification Instructions ”,“Application for Pyro License ”, a finger print card , and 5 copies of “Pyro Technician Affidavit ” or from the state “Pyro Technician Affidavit. ” You have to get the statements and signatures from 5 Pyro III on the Pyro Technician Affidavits. Note:This is specific to anyone currently applying for a Cal Pyro III. As of July 1,2005, the DOJ (and hence the entire state of CA) no longer accepts fingerprint cards. As a result, you must find a "Live Scan" facility (http://caag.state.ca.us/fingerprints/publications/contact.htm for a list) and getting fingerprinted. BTW., the billing code (for the DOJ to bill the OFM) was incorrect on my form. It should be 100089. Take Caroline Fudge's number 916-445-8373 with you when you go to the Live Scanfacility.Live Scan is not as ubiquitous as ink fingerprinting, so it may be a bit ofa pain to find a facility. Also, the little portable scanners are very new and don't work very well, so be prepared to spend an hour or two getting your fingerprints submitted. It seems to now be around $18. Next I had to find 5 Pyro III. First one was easy. Joe Hackenbach. Next I scheduled my family for a Fresno launch hoping to get some signatures. We had a fine Easter day launch flying plastic Easter eggs filled with M&Ms. I didn’t get signatures and that’s all I’ll say about that. Keeping the membership database has its advantages. I looked in the database and found we had 6 Pyro III registered with LUNAR. So I started calling them to see if they’d sign my paperwork. Each one agreed. I filled in all the information on the affidavit so they only had to sign and put their number on it. Two weeks later and I had all 5 signatures. Armed with 5 affidavits, my finger print card, my application and $87, I sent the whole works to the “CDF/STATE FIRE MARSHAL ” and waited to receive my study packet. At the May LUNAR launch, we didn’t have a Pyro III again. I pointed out one of the people who signed my paperwork. He said, “I’m Certified level III, not a Pyro III.” Oh, boy. One of my signatures was no good. Would the “CDF/STATE FIRE MARSHAL” catch the problem? A week and a half later, I got my study packet “Laws and Regulations for Transportation, Use and Storage of Fireworks in California ” and an “Examination Eligibility Notification ” letter. Guess they missed that one of my signatures was not valid. After returning from a 6,000 mile journey going through Air Museum at Hill AFB Ogden, UT, Iowa, LDRS XXII in Argonia, KS, a Titian II missile silo south of Tucson, AZ and the Tucson, AZ Air and Space museum, I made the call. My test date was the next week, 10am Wednesday Aug 13 in Sacramento. One of two places in the state where you can take the test. The morning of the test, I dressed in appropriate attire. Dress pants, dress shoes and “As a matter of a fact, I am a Rocket Scientist” t-shirt. Armed with my GPS, 4 diet A&W Root Beers in a cooler and a bag of Twizzlers (don’t laugh, I already know but I had to keep awake), I was set for my 2-hour drive. I allowed 3 hours for traveling through whatever unknown traffic I was about to face. Fortune smiled on me and I arrived 2-hours after I left. An hour ahead of my test time. I checked in at the CDF/State Fire Marshals office and they said I could take my test early. 9:15am and I was seated in an office with a 50 true-false question test. Let me warn you that this test is littered with what I would call bad questions. I work in the teaching industry and I’ve had education in question writing. So I have a bit of an unfair advantage. But I’m sure all of you will recognize what is wrong with these questions. I’ll give you an example. “It is permissible to launch rockets in winds less than 40 mph.” Now is that “True” or “False”? I’ll put the question into terms that we can all understand. “It is legal to drive less than 100mph.” My freeway is posted 65mph. 60mph is legal and that is less than 100mph. So it’s true. But 90 is less than 100mph and that is not legal. So it’s false. The sorry point of this story is that I don’t know which is the correct answer. True or false? I do know that the limit is 20mph winds for flying rockets. There were at least 4 questions of this nature on my test and they sorely irritated me. Swell, which is correct? Fortunately for this question it didn’t matter. So now it’s time to fulfill my foreshadowing. In the immortal words of my mentor Joe Heckenbach, “When it comes time to study for your test, you only need to look at the rocketry parts. You can skip all the fireworks stuff.” I had studied Part 5, the rocketry parts. It’s essentially a copy of the model rocketry safety code. Now after taking the test and trying to find all the questions I didn’t know, I’m guessing that Part 5 is the model rocketry handbook and has no bearing on California law. Because in Part 2, State Fireworks Regulations, which is from Title 19 of the California Code of Regulations, it quotes Chapter 6, articles 16, 17 and 18 which are all about rockets. You’ll need to study these too. Part 2 has some contradictions to Part 5 and apparently it takes precedence because that is what is on the test. The test only uses the language of Experimental High Power Rocket Motor. So this is where we learn about the California M motor (10,240NSec) limit and N (20,480NSec) total impulse. While the Model Rocketry handbook goes to O motors. In addition, a G125 which has less than 160Nsec of impulse is a model rocket motor according to the Model Rocketry handbook but it’s an experimental high power motor according to CA because it’s over 80N of average impulse. Fortunately you don’t have to keep them straight for the test, you only need to know California’s rules. But talking to out of state rocketeers and lead to confusion. Now that is a definition! Is California following this? In some ways no, and it’s not on the test so you don’t have to worry about it. “With proper ventilation can you static test a rocket motor indoors.” No you may not conduct static testing indoors. There were two questions on this worded slightly differently. “You may launch rockets with the launch pads within 750, 500 feet of the edge of launch site.” It never says what impulse of motor. So how can you answer this? According to the Model rocketry handbook, 50 feet is fine for A motors. Part 2 lists the smallest site dimension is for H motors and it’s 1500 feet. I guess I got this right because I called both questions false. But I called them false because I knew I could fly A’s at 50 feet. “It OK to include a major highway on the edge of the launch site as part of your recovery area.” This didn’t seem very wise so I answered false. I did find it in the book too. “Minimum visibility above a launch site is 5,000, 10,000 feet.” What is the answer to this one? I know that we can not fly rockets into clouds. Knowing my rocket only goes to 900 feet, and the clouds are at 2,000 feet. I can fly. So I called both of these answers false. No way to answer without knowing how high the flights were suppose to go. Later I did find that Part 2 specifies 5,000 feet. Yet another contradiction in the book, because Part 5 says do not fly into the clouds. (a) No model rocket motors shall be sold, given, or delivered to any person under 18 years of age. (1) Model rocket motors bearing the standardized coding 1/4A, 1/2A, A, B, C, and D may be sold, given, or delivered to any person 14 years of age or older. Purchasing or using by persons 17 years old or younger of reloadable model rocket motors or motor reloading kits that do not meet the specifications of 16 CFR 1500.85(8) and (9), “Consumer Product Safety Commission Regulations. So on a test that is about obtaining a Pyro III license with a question that does not mention the type of rocket motor, should you assume it is about an Experimental High Power Rocket Motor? I guess so, so I missed this question. “A Pyro III can sell rocket motors.” This is false, you must have a retailer license. This statement is without regard to numbers of people. I assume I got it right. Table 18A lists minimum distance from launcher for total impulse from 0-320Nsec as 30 feet where as the model rocketry handbook lists 0-30NSec as 15 feet and Over 30Nsec as 30 feet. Part 1, Chapter 1, Section 12519 says a model rocket is less than 500g where as the Part 5, Chapter 3, says 453g. In the end, I passed. 70% is minimum. I got 72%. That means I got 36 of 50 questions correct. I could have missed one more and still passed. If you have any questions please feel free to contact me in any of the following manners. Application for Pyro License The California Class III Pyrotechnician license application. Code of Federal Regulations FAR 101 HTML web page. Examination Eligibility Notification Microsoft Word document. After returning the above documents to the CDF, you'll get this notifcation that you are eligible to take the exam. Finger Print card JPG graphic. 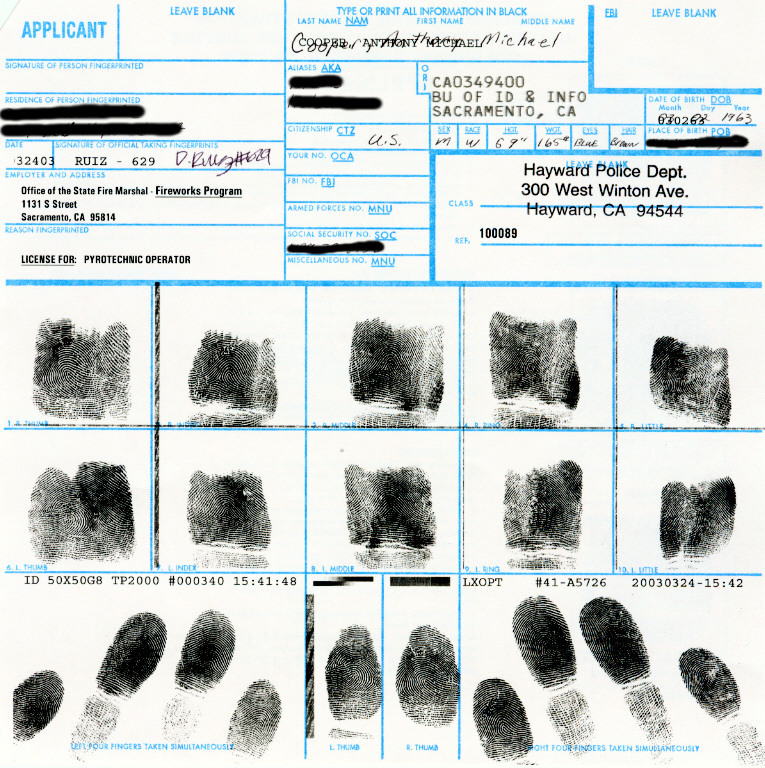 An example of a finger print card that comes with your application for a California Class III Pyrotechnician license. High Power Rocket Safety Code NAR handbook on how to fly High Power rockets safely. Laws and Regulations for Transportation, Use and Storage of Fireworks in California 2011 Edition PDF Adobe Acrobate document that explains the "Laws and Regulations for Transportation, Use and Storage of Fireworks in California." It also includes the model rocketry safety handbook as a reference. Model Rocketry Safety Code NAR handbook on how to fly model rockets safely. NFPA Codes NFPA Catalog search results on Rocketry. I find it hard to believe these folks sell these. Seems it should be a free download. Pyro Technician Affidavit Microsoft Word document. When applying for a California Class III Pyrotechnician license, you must get 5 references who must fill out these affidavits. Pyro Technician Affidavit PDF option to the above documents. When applying for a California Class III Pyrotechnician license, you must get 5 references who must fill out these affidavits. Pyro Technician Certification Instructions Microsoft Word document. It's the instructions you get when you apply for a California Class III Pyrotechnician license. Table of Distances HTML Page that lists site distances from launcher and houses in relation to motor size. Table of Flight Restrictions HTML page that I created to attempt to make it simple to understand what your restrictions are to flying rockets in California.